You and your staff have turned our home into a show place; it is absolutely beautiful. At Night, when the lights go on in the trees and shrubs it is transformed into the category of being a “unique home”. We also enjoy watching the sprinklers throwing water everywhere. In recent years we have taken on three major exterior enhancement projects on our home. That being the extension of our kitchen into an outdoor sun room, our pool and our latest project give to our front and back garden a warm welcoming character of it’s own. 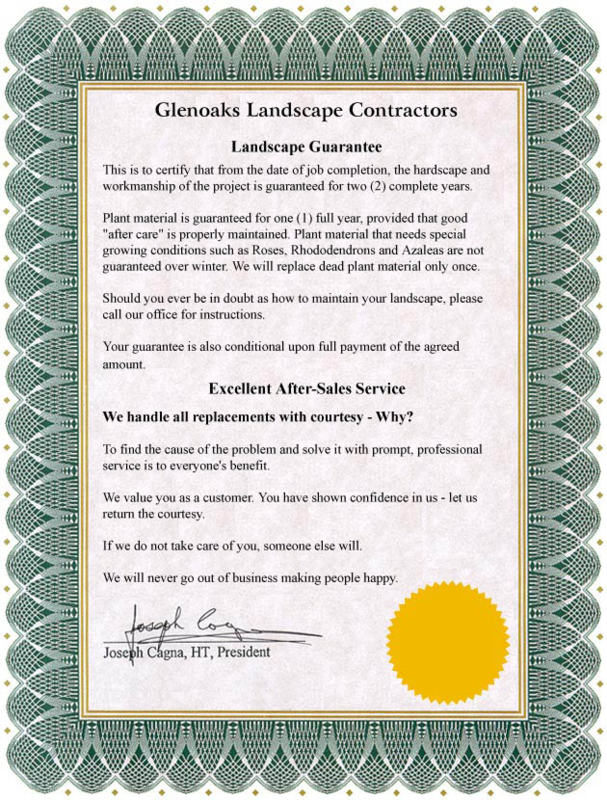 It is almost a year since your organization has landscaped our garden and I am writing to you and Joe to thank you for the exceptional service provided by Glenoaks. It is not often that the service one receives compels one to write a letter of thanks to an organization. Now that the project is finished we wanted to write and thank you for the meticulous care and attention you brought to landscaping our garden. A building project had left us with a greatly ‘chewed up’ back lot, a semi-demolished patio and walkway, and a big pile of fill in the middle of everything. Enclosed please find the payment for the work Glenoaks did in repairing our fence and building a timber retaining wall. When people who are simply driving by your house stop to look, you know there is something worth looking at. Since you worked your magic with our landscaping, people have stopped to look at and to admire your work.